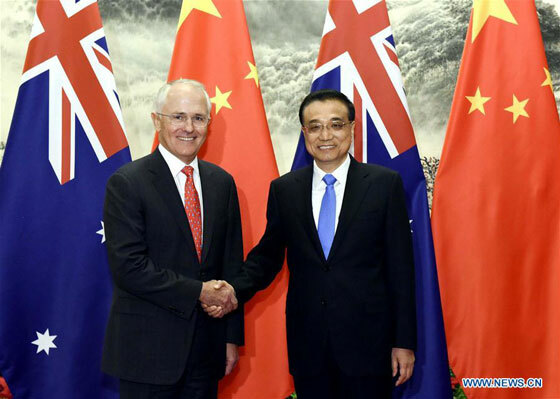 Chinese Premier Li Keqiang voiced confidence in the prospects for the China-Australia relations in the fourth annual talks between the two countries' prime ministers. The meeting, on Thursday afternoon at the Great Hall of the People, was co-chaired by Australian Prime Minister Malcolm Turnbull, who is paying his first official visit to China since taking office in September 2015, with a large business delegation. Calling Australia an important cooperation partner, Li said China was ready to strengthen mutual trust with Australia, synchronize development strategies, expand cooperation, and properly handle disputes on the principle of mutual respect, equality and reciprocity, so as to push forward a sustained and stable development of the bilateral relations. Li briefed Turnbull on China's structural reform, mass entrepreneurship and innovation, which will be new opportunities for cooperation. He urged both sides to strengthen synchronization of development strategies, give further play to a joint committee on technological cooperation, and promote joint research and development in areas including food, agriculture, mining and maritime science. Li welcomed Australia to establish an overseas innovation base in Shanghai, and voiced support for the two countries to jointly establish innovation parks and technology transfer centers to promote cooperation between firms, universities and research institutes. Shanghai is also the first stop of Turnbull's visit from Thursday to Friday. Li said China was willing to conduct production capacity cooperation with Australia in infrastructure construction and equipment manufacturing, while seeking opportunities in new energy, new-type urbanization, environmental protection and transnational e-commerce. He also urged the two countries to strengthen cooperation in overseas studying, tourism, judiciary, law enforcement and defense, deepen friendly exchanges between localities, and maintain close communication and coordination under regional and international mechanisms to promote the peace, stability and common development in the region and the world. Turnbull said China is an important trading partner of Australia and he was optimistic with China's economic development potential. He said Australia will adapt to China's economic structural reform and make use of the opportunities brought by it, strengthen cooperation in e-commerce, agriculture, animal husbandry and technology, and jointly promote the peace, stability and economic growth in the region and the world. The two sides also discussed international and regional issues of common concern. After the talks, the two prime ministers witnessed the signing of five cooperation deals between the two countries in areas such as technological innovation, tourism, industrial parks and mining.